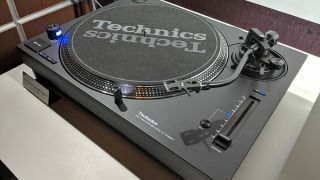 Technics SL-1200/SL-1210 MK7 price and release date confirmed | What Hi-Fi? The most exciting news for some of us at this year's CES has been the relaunch of the famous Technics SL-1200 DJ turntable range. And now we have a few more details. Firstly, there will only be a black model, no silver deck (for now). The SL-1210 MK7 is simply the name for the UK and EU, while the SL-1200 MK7 is for the US and Japan. There's no other difference between the two turntables. As for the price, while Technics is still ironing out final details, What Hi-Fi? has been told the SL-1210 MK7 will be £899 / 1000 euros, while the SL-1200 MK7 will be $1200. That's a lot cheaper than the originally relaunched hi-fi decks and around the same price as the original SL-1200/1210s. It's been ten years since the range has been produced, and longer still since previous SL-1200 models were widely available, so a price comparison isn't easy. Still, it's about as affordable as we could have hoped - and sure to have a lot of turntable fans tempted. The release date is set for summer this year (we were originally told May but have since had a further update), so if you're interested, you shouldn't have too long to wait.